Snow showers likely, mainly after 4am. Partly cloudy, with a low around 21. Breezy, with a west wind 18 to 24 mph, with gusts as high as 32 mph. Chance of precipitation is 70%. Total nighttime snow accumulation of less than a half inch possible. Periods of snow showers. The snow could be heavy at times. Some thunder is also possible. Patchy fog before 11am. High near 32. Very windy, with a west southwest wind 25 to 30 mph increasing to 36 to 41 mph in the afternoon. Winds could gust as high as 60 mph. Chance of precipitation is 100%. New snow accumulation of 8 to 12 inches possible. A 50 percent chance of snow showers before midnight. Some thunder is also possible. Mostly cloudy, then gradually becoming mostly clear, with a low around 12. Wind chill values as low as -10. Very windy, with a west northwest wind 35 to 40 mph decreasing to 23 to 28 mph after midnight. Winds could gust as high as 50 mph. New snow accumulation of around an inch possible. Sunny, with a high near 26. Wind chill values as low as -5. Very windy, with a west wind 22 to 27 mph increasing to 32 to 37 mph in the afternoon. Winds could gust as high as 46 mph. A 40 percent chance of snow showers after midnight. Partly cloudy, with a low around 15. Very windy, with a west wind 32 to 39 mph, with gusts as high as 46 mph. New snow accumulation of less than one inch possible. A 30 percent chance of snow showers. Mostly sunny, with a high near 22. 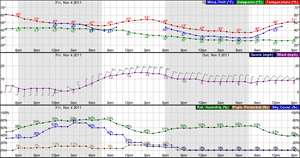 Very windy, with a west wind 31 to 36 mph decreasing to 25 to 30 mph in the afternoon. Winds could gust as high as 45 mph. A 40 percent chance of snow showers. Partly cloudy, with a low around 8. Blustery, with a west northwest wind 15 to 24 mph, with gusts as high as 33 mph. A 40 percent chance of snow showers. Partly sunny, with a high near 19. Breezy. A 40 percent chance of snow showers. Mostly cloudy, with a low around 13. Breezy. Snow showers likely, mainly after noon. Mostly cloudy, with a high near 21. Breezy. Chance of precipitation is 60%. Snow showers likely. Cloudy, with a low around 12. Breezy. A chance of snow showers. Mostly cloudy, with a low around 11. Breezy. Mostly sunny, with a high near 27. Breezy.